Welcome to our lab at the ﻿Institute for Stem Cell Biology and Regenerative Medicine (inStem)﻿, sharing a lovely campus with the National Center for Biological Sciences (NCBS). Cells, as defined, are the quintessential membrane-bound units that contain the fundamental molecules of life. Yet these bags of molecules carry out remarkable chemistry to replicate their DNA, divide, grow, and change form or function. In cell groups, they communicate with each other, sharing information to control each others' fates. All of this is driven by biochemistry. We are interested understanding the biochemical logic driving information transfer within and between cells. At the heart of information transfer, and central to life, is metabolism, which are the chemical processes required for life. Our goal is to understand what makes some metabolites special, and how they are sensed within a cell, and how they can determine what happens to a cell. How much of the organization of a cell can we understand by understanding the molecules that make it up? More specifically, our research extends to understanding: the different fates of amino acids and how that determines cell fate, what "metabolic costs" actually mean to a cell, and bringing a metabolic perspective to address how genetically identical cells organize into distinct cell groups. You can learn more about our work on our research page, read our publications, join us, and explore our resources. ﻿﻿Our research is supported by a Wellcome Trust-DBT India Alliance fellowship, grants and institutional support from inStem and DBT ( Centre of Excellence grant), and infrastructure support from inStem, NCBS and C-CAMP. Feb 2019: Adhidh Walvekar wins an AWSAR award from DST (2018, Postdoc category). Feb 2019: Shreyas joins the lab after his rotation. Welcome! December 2018: Read our latest, editorially highlighted paper in MBoC, on methionine as an anabolic signal. October 2018: Read our new methods paper in Wellcome Open Research, on targeted metabolomics and metabolic flux analysis. July 2018: Read our new, editorially highlighted paper in MBoC, on oscillating between quiescence and mitotic division. July/Aug 2018: Ruchika and Swagata start in the lab. Welcome! June 2018: Malavika and Shree Padma finish in the lab, and now head out to the USA for grad school! Bon voyage, and all the best! June 2018: Adhish Walvekar is one of the winners of the SERB-NPDF research competition, and will present in Delhi later this year. Congratulations! May 2018: Sreesa, Nidhi, Harini and Swagata finish their masters thesis projects in the lab. Well done! Aug 2017: Vinca, Shree Padma join the lab as JRFs/Project assistants. Welcome! June 2017: Sriram is awarded a Wellcome Trust-DBT IA Early Career Fellowship. Congratulations! April 2017: New, short, useful paper out from the lab, on how cells deal with cysteine toxicity. Read here. March 2017: Read our new review, on "Conceptualizing eukaryotic metabolic sensing and signaling", in a special theme issue of The J. Indian Inst. Sci. Download the pdf. March 2017: Congratulations to Rajalakshmi and Sriram for being awarded DST SERB-National Postdoctoral Fellowships. Jan 2017: Ramya heads off to Boston on a B4 postdoctoral fellowship. Oct 2016: Amit heads off to the Weizmann institute for his PhD. Good luck! September 2016: Ganesh KB starts his joint postdoctoral fellowship here and with the Frezza lab at Cambridge. Welcome! July 2016: Ritu Gupta is awarded the DST-National Postdoctoral Fellowship. Congratulations! June 2016: Sneha starts in the lab. Welcome! May 2016: Ritu Gupta is awarded the DBT-RA postdoctoral fellowship. Congratulations! May 2016: Welcome to all the interns and masters students in the lab! March 10, 2016: Adhish is awarded a DST-National Postdoctoral Fellowship. Congratulations! March 9, 2016: Congratulations to Hemanth for winning a poster award at Annual Talks! Jan 1, 2016: Vineeth starts his masters project in the lab. Welcome! Dec 16, 2015: Read our recent perspective article in J Cell Sci, on yeast and stem cell quiescence. Dec 14, 2015: Sriram joins the lab as a postdoc. Welcome! Dec 14, 2015: Zeenat joins the lab for her PhD. Welcome! Oct 19, 2015: Zeenat and Pratyay start rotations in the lab. Welcome! Sept 3, 2015: Dr. Ritu Gupta joins the lab (postdoc). Welcome! Aug 17, 2015: Hemanth joins the lab (RA). Welcome! Aug 3, 2015: Meghana joins the lab (RA). Welcome! July 24, 2015: Rudra starts his joint IIT-M/inStem MS thesis here. May 1, 2015: Amit Agrawal joins the lab (RA). Welcome! March, 2015: Sunil Laxman starts on a Wellcome trust-DBT India alliance Intermediate fellowship. Feb 2, 2015: Dr. Adhish Walvekar (postdoc) starts in the lab. Welcome! Jan 2, 2015: Krithika joins the lab as a JRF. Welcome! Dec 26, 2014: Terence Christie starts his graduate rotation in the lab. Welcome! Dec 16, 2014: Read our paper on the regulation of glutamine metabolism by the TOR complex in Science Signaling. Oct 31, 2014: Sunil Laxman selected for the prestigious Ramalingaswamy re-entry fellowship from the Department of Biotechnology. 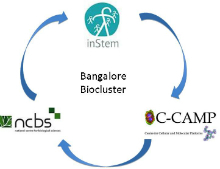 Oct 31, 2014: The Laxman lab officially begins at inStem, located within the SLC building of NCBS.